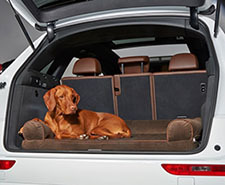 This very versitile dog bed was originally designed to fit the in rear cargo areas of SUV's, station wagons and vans. However, this low profile bed makes a great addition to your home. 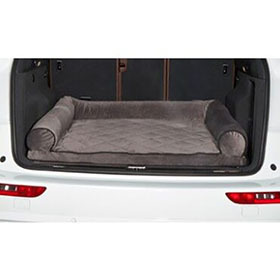 The bed is constructed with two inches of furniture grade foam topped with 1 inch" of high loft fiber to make this a comfortable bed for all dogs, especially older and arthritic dogs. Firm footing for all breeds with cozy bolsters. Cleaning: Unzip cover and remove foam insert and bolster. Rezip, machine wash and dry cover only on cool setting. Tufting prevents fiber from shifting. NOTE: Almond is out of stock & will be available after January 7th.